This was my big, in every sense of the word, race of the year. In ran this race in 2009 and came closest to having a dnf when I got lost at Scarborough and basically walked the last 35miles. I always wanted to come back and have another go and that time was now! Katrina and I left Paisley at 9.30am on Friday morning and had an easy journey to Saltburn with a stop at Penrith for some lunch at McDonalds. Katrina was going to meet me at Saltburn (60miles) and then again at Scarborough (100miles) so I wanted to make sure she knew how to get there and where her b&b was in Scarborough. 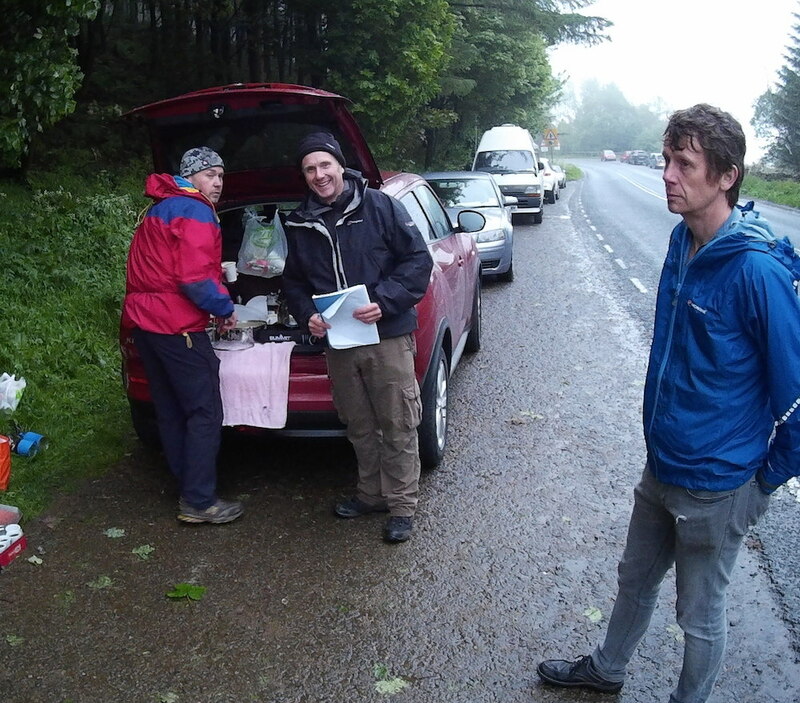 Katrina drove to help her with the route but didn’t enjoy driving in the mist and rain! I was hoping it would be better from her (and me) tomorrow. We found the b&b with thanks to Google maps. No one was in so we walked down to the spa hotel where the checkpoint would be and had a drink. 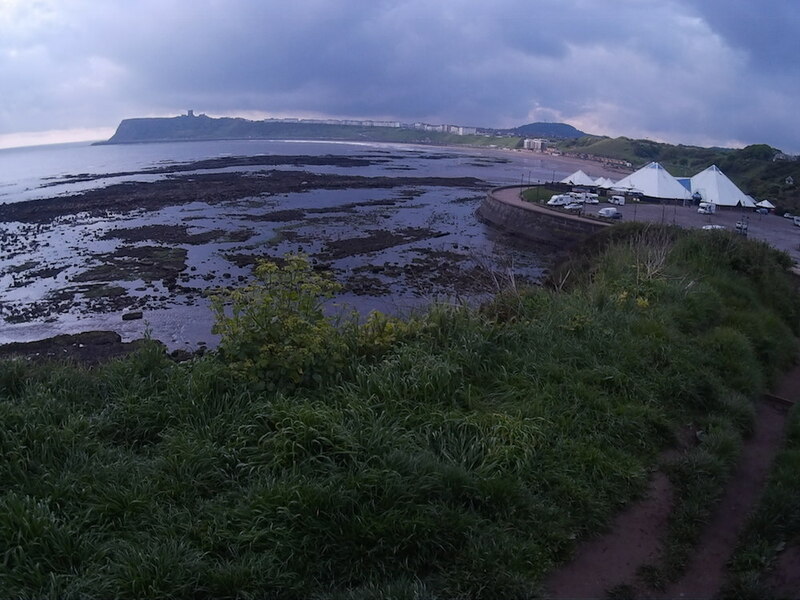 We realised that the Hardmoors 160 was about to start but it was at the other end of the prom. Katrina suggested trying to see the race further along. We looked at the tracker for Dave Kamis and realised that we might see them at Everley. We sorted out the B&B where the owner was super helpful and headed out to spot the runners. We timed it just right and saw about 12 runners including Dave. We stopped and took some photos. I said I was doing the 110 and I might see them tomorrow to which one guy replied. ‘Oh you are doing the fun run are you! !’ I thought this was very funny! Describing a very tough 110mile run as a fun run!! 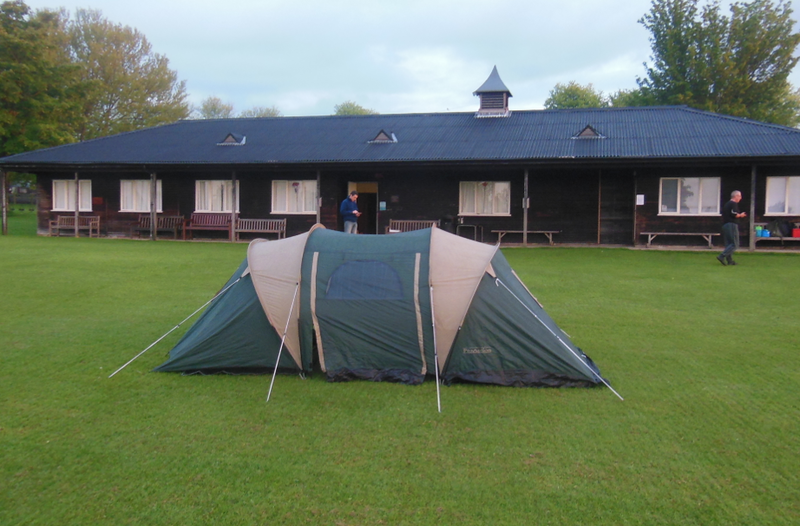 We stopped at Pickering for some fish and chips then headed to Helmsley to register and set up our tent for the night. Dave, Tracey and Paul (Dave’s) Dad arrived so we followed them over to the Youth Hostel for a chat before heading back to our tent for a sleep. I slept okay but I did hear the 160 leaders come through about 2.30am and then another group at 4.30am. I got up about 5.45am really looking for to get going and seeing whether I could achieve what I set out to do. Katrina was helping on kit check so for the next 90mins I got ready, packed away the tent and got changed into my kit. Soon enough Jon gathered us all outside for the race briefing and we were ready to go! I started half way down the field as I was determined to run my own race and pace myself sensibly. For me this race was all about the second half and keeping enough back to be able to still be running right to the end. To help me with this I decided to run to my heart rate. Robert Osfield, who paced himself superbly at the fling, helped me and reckoned based in my last two races that I should aim for a heart rate of 124. I knew this would take some discipline but I was didn’t realise how hard it would be. On the first hill were normally I would run up I had to walk and a number of folk went past me. I just hoped I might see them again. I did have to really concentrate though. I had my watch on the heart rate and I was constantly checking to make sure I wasn’t going too fast. It made me realise how much faster I would normally start an ultra. I was just hoping that this cautious approach would pay off in the long run. I ran with a guy called Graham for a while and we missed the turn off down to Cold Kirby. We realised our mistake quite quickly so only lost a minute or two but it was a lesson in the importance of concentrating on the route even when you think you know it. I was using the gps trace on my Suunto Ambit and it worked really well. I was through my second mini-split on target and more importantly feeling really easy. As we went through Cold Kirby I was with a group of runners. For the next mini split to White Horse I continued to concentrate really hard on keeping my heart rate to around 124. If this meant letting people go then that was fine but I think I held my place quite easily. I was drinking my energy boost regularly and also had a piece of fruit bread with jam which was tasty. As we came to cross the road I saw Dave Troman’s Dad Paul waiting for me. I’d said to Dave before the race that one of my aims for the race was to finish within 3hrs of him! So I wanted to get an idea of how far he was ahead after almost 9miles. Paul said Dave’s 24mins ahead! Wow …. I spent the next few minutes calculating that if it took Dave 60mins and me 90mins then at that rate if it took Dave 24hrs it would take me 36hrs!! Or if it took me 28hrs it would take Dave 19hrs. Either way at this rate I wasn’t winning this one!! 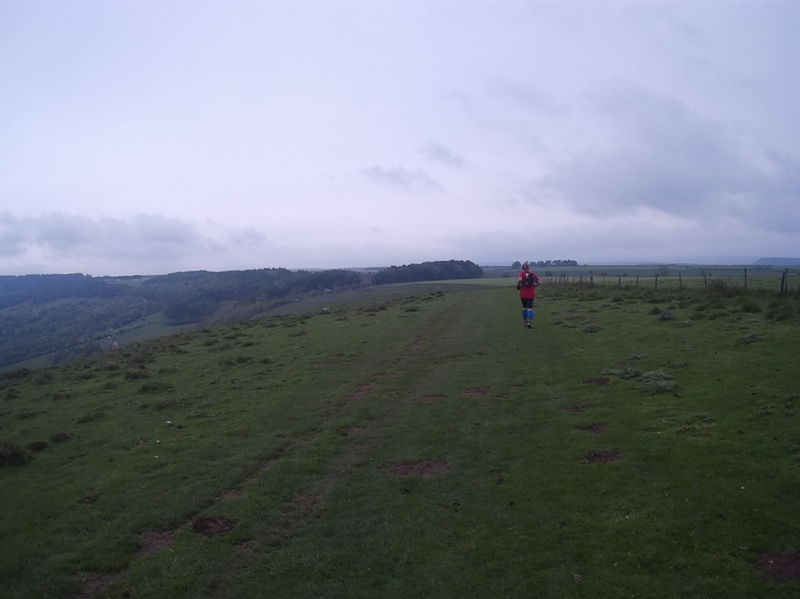 As I headed out to White Horse with Graham we saw Dave running back. He looked in great shape and obviously going very well. We had a quick greeting and went in our different directions! We descended the steps to the check point. I glanced at my watch and saw that I was 4mins over my plan but I realised that I not added in the 0.5 mile from the Football ground to the start so I reckoned I was spot on! Just a note here …. When I got home there was a problem downloading all my data from my Suunto Ambit and sadly (for me!!) I’ve lost all my splits, heart rate, elevation, mileage etc. Gutted!! Anyway I’ve been able to piece together the main splits from my Timex watch, the tracker and the official splits taken at the checkpoints. I refilled my water bottle with my energy drink and set off through the trees back up the path. After a few minutes I caught up with a group of about 6 runners. I stayed with them as we climbed up the hill. Normally I would walk climbs like this quite hard as I feel it’s one of my strengths but I eased off as I was committed to keeping my heart rate down. Once we got onto the path I settled into a nice easy run with a few walking breaks to keep the HR down! The next few miles are great for running with soft paths, some grass and some superb views to keep you entertained. I felt right into the race now, happy with my conservative start and more determined than ever to run well within myself so that I could enjoy the second half of the race. I decided to give Katrina a ring to see how the drive to Saltburn went. She was already in Saltburn after an easy journey. It was just after 10.30am and I wasn’t due there until 9pm so she had plenty of time to relax and enjoy the day! Katrina ended up helping at the checkpoint from 2pm when it opened to when I arrived! As I approached High Paradise Farm I ate my second piece of fruit bread. As I did so I felt my false tooth crack. I took out my plate to discover it’s gone. I took a photo so I could see try and see it! I could see a couple of runners not too far ahead but basically I was on my own and quite happy with that. In races I tend to prefer to be on my own. I enjoy chatting and running with people and if it works out we are going the same pace that’s fine but the problem can be if you end up running faster or slower that you want to. I climbed up on the path over the moor and down the stretch heading towards Osmotherley. I caught up with a couple of guys and we ran down the hill to the checkpoint together. I must admit I wasn’t expecting the checkpoint up on the hill. I assumed it was down in Osmotherley so my normal thorough preparation was lacking, as I hadn’t checked the grid reference! It was probably half a mile or so before Osmotherley. The excellent marshals handed me my drop bag and I quickly refilled my water and ate my mashed sweet potato and cheese. I had a quick chat with Jon Steele then I was on my way down to Osmotherley and the next leg to Lord Stones. I ran out of the checkpoint on my own. That would be repeated at most of the time. I was taking less time than those around me which I was happy about. As I ran down the hill I had a mental check over and was happy with how things were going. Still a long, long way to go but a good solid start. As I ran through Osmotherley I saw a 160 runner, Jin Cao, who was coming out of a shop. I asked him how it was going and he said he’d just bought some proper food in the shop. I caught up with a couple of 110 runners and we headed up the hill together. The weather was closing in and it was starting to rain but I felt it wasn’t cold enough to put my jacket on. At some point I must have lost the guys because I was on my own and slightly off line! I could see the where I should be in the woods but I was in the field parallel. A younger guy Ben was behind me. It didn’t take long to get back on track and run past the TV tower so I don’t think it cost me any time but 2 small detours in the first 25 miles wasn’t ideal! I went past a couple more runners and was reminded of Robert’s final post on my blog when he said you will start catching those who had maybe gone off a little too fast. In the Fling with over 600 runners there will be lots to catch but there were only 62 starters in the HM 110 so not so many to go past! Over the next hour or so I had to hold back a few times as my heart rate crept up. I was tempted to just go for it and run as I felt but I’d made a commitment to myself and decided I wanted to see if this tactic would mean I would be able to enjoy the second half and finish strong. I thought of my friend Stuart Mills who has the complete opposite tactic of going off as hard as he can for as long as he can and then hold on to the end. I don’t think he would be very impressed with me as I held myself back! 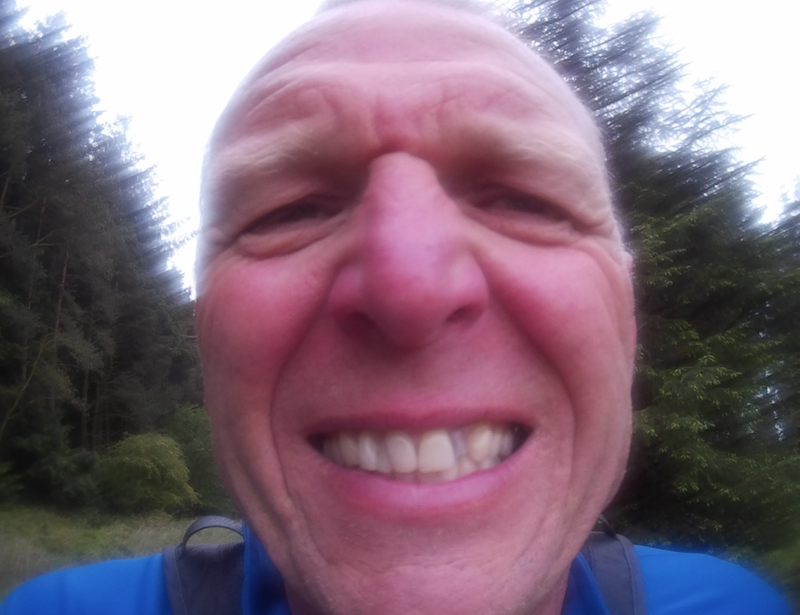 There are 3 fairly big climbs over the next 15 miles so I settled into a good rhythm of walking steadily up and running down as relaxed as I could. My quads felt great and I really felt I was benefitting from all those trips up and down Ben Lomond. The visibility was very poor and it was getting quite cold especially on the tops. A couple of times I thought about putting on a jacket but I seemed to get over the top okay and once I descended it warmed up again! I caught up with 2 runners who were doing the 160. I recognised the figure of Dave Kamis as one of them. I stopped and chatted with them and took a photo before wishing them all the best for the remainder of their journey! 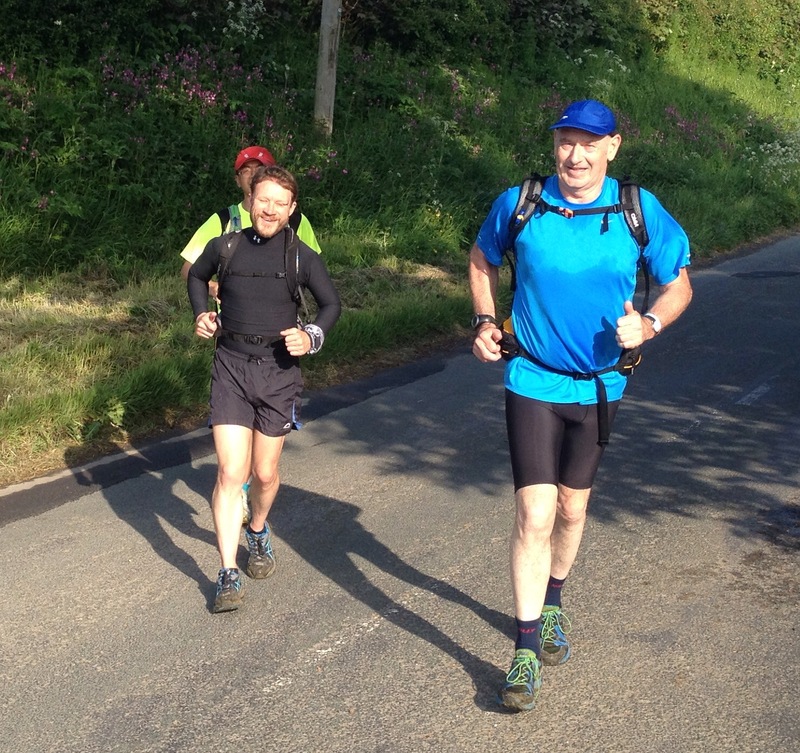 As I descended to Lord Stones it was good to see Steve Walker at the checkpoint. I refilled my water, took some flap jack and jelly babies and was on my way very quickly. There were a few supporters out as I crossed the road. A guy in front was going up the wrong path to the left rather than straight on. I knew I was right (this time!) so called out to him. I could see him checking his map so hopefully he did follow me. As I climbed the next hill Ben caught me again and we had a chat about our mistake earlier. This was Ben’s longest race so far and he was going well. Sadly I’ve checked on the results and he stopped at Saltburn which surprised me as I thought he was pacing it well. Up and down the second of the 3 sisters and there was John Vernon waiting for us at Kirby Bank. He was very cheerful and noted my number and time. I couldn’t resist asking when Dave T was through. John said 1hr 40mins ago and he was looking strong! I did another calculation and was happy to work out that I wasn’t losing 30mins in every 90!! So after almost 5hrs I was 1:40 behind. I was really pleased he was going so well and knew that he would get even better on the second half. I was hoping that I could too! 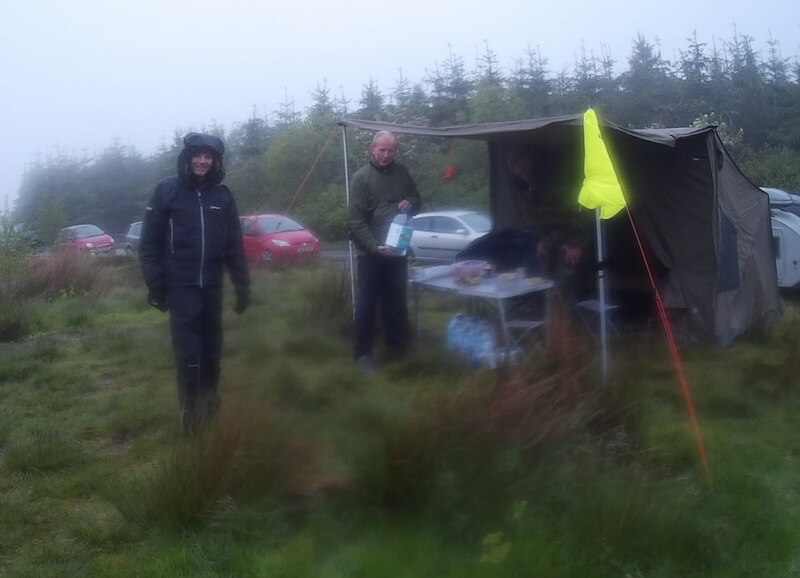 Another climb over the 3rd sister and down to Clay Bank where the marshals had some lovely hot soup waiting. It went down so well. Thanks guys. Tim Bateson was there waiting for Phill Turton. I don’t remember going past Phill but according to the splits he was definitely ahead of me to Lord Stones but behind at Kirby Bank. Maybe he was the runner I shouted to who was going off line? On my splits it said that Bloworth Crossing was 5.25 miles away but I knew it was nearer 3.25 miles. I must have made a mistake and taken the distance from Kirby bank rather than Clay Bank. Anyway it meant that I was going to get to Bloworth Crossing a lot closer to my plan than I thought. It was getting really cold and windy now so I stopped to get my jacket on. It was a good job I did as once I climbed up it was even colder and windier. I was moving well as I caught up with 3 runners including young Ben who had gone ahead again. I was still looking at my heart rate every now and then but I felt it had done its job. It had really helped me to get over 35 miles into the race without doing much damage. I took a lot of encouragement that I was moving better than those around me. I arrived at Bloworth Crossing with Giles Tollit. Dave T had introduced me to Giles before the race as they had run the Ring of Fire in Anglesea last year. Giles very kindly clipped my number that was on the back of my pack and in return I took a photo of Giles! We had almost 6 miles to Kildale and we ran together most of the way. That 1hr 15mins was the longest I ran with anyone in the whole race. We chatted the whole way and it was good to have some company. Giles is a head teacher of a boarding school in southern England but there family home is in Snowdonia. 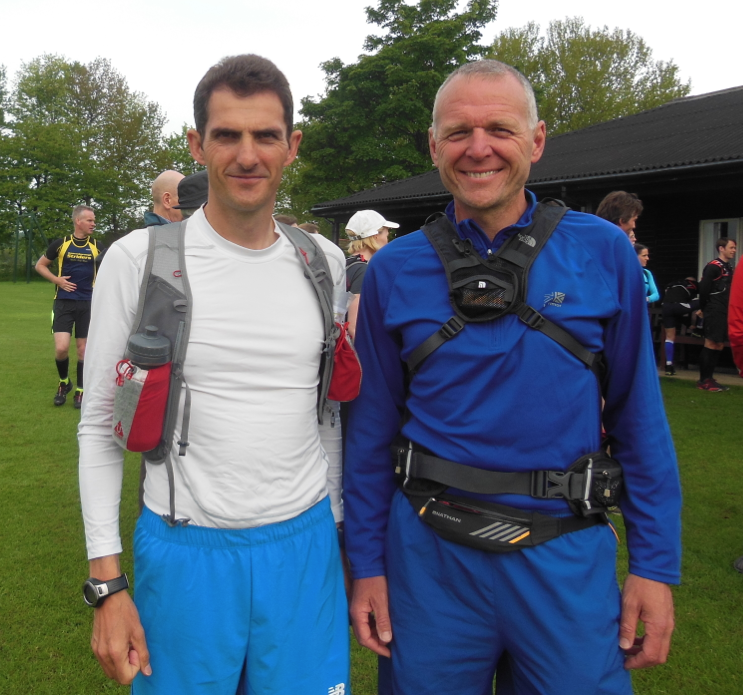 Giles finished the Lakeland 100 last year in under 30hrs so I was happy to be running at this stage with him. It was good to arrive at Kildale as it’s the first indoor checkpoint. There were a few runners sitting around so I made a decision to stand and move on as quick as I could as once you sit down it’s hard to get up and going again. The excellent marshals refilled my water and gave me some lovely rice pudding which I added a big spoon full of jam to. Within 5mins I was off and out. I definitely felt like a man on a mission! Dave T and I had done 2 recce runs starting here a few weeks ago so I had a good idea of what was to come. 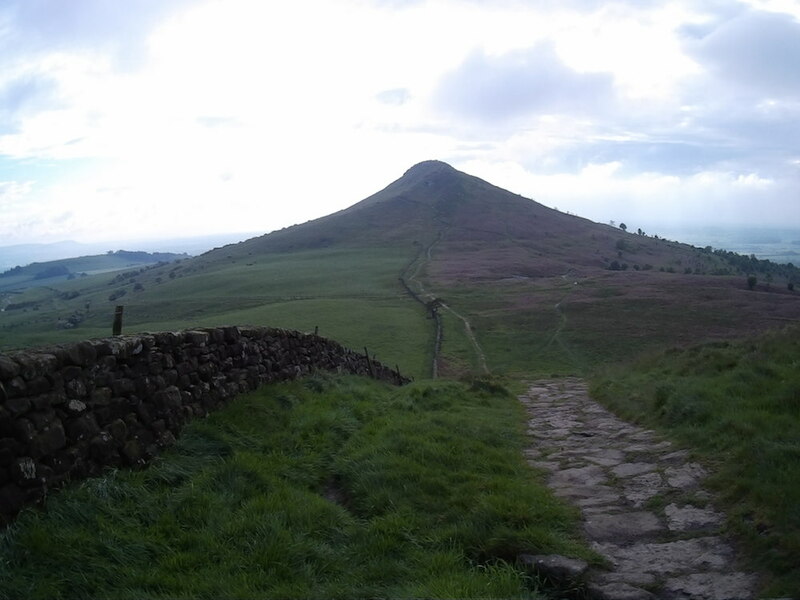 My first mini split was Cooks Monument (2 miles) then Roseberry Topping (a further 2.4 miles). I could see a couple of runners not too far ahead and soon enough I caught up with them. One was Mark Dalton who was doing the 160. 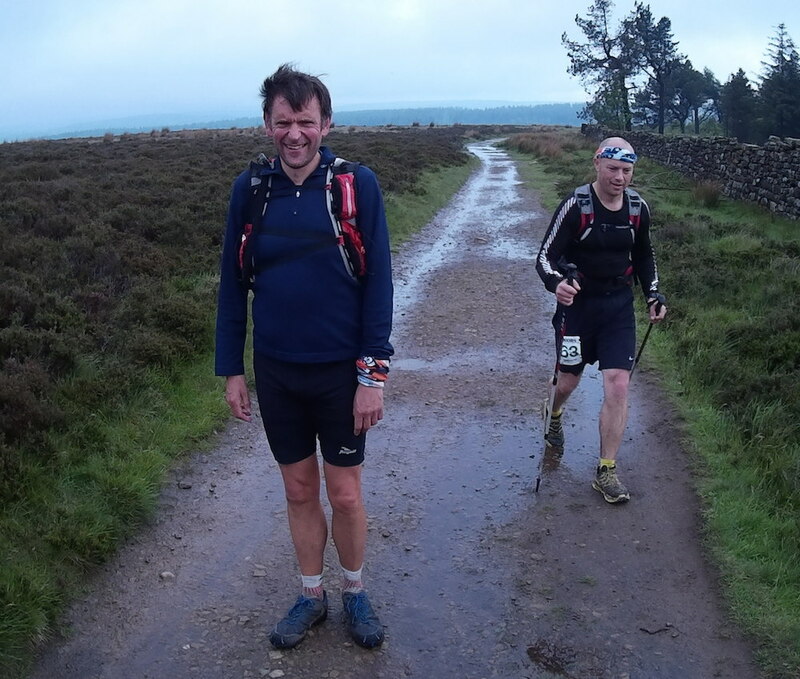 I had run with Mark on 2nd Jan when I did a recce run from Osmotherley to Helmsley in preparation for the Hardmoors 55. Mark was in great spirits and working out that if he could keep moving at 3miles an hour he would have plenty of time to make it to Filey. We ran together for a while and then as Roseberry Topping approached I wished him all the best and pushed on. As I climbed Roseberry Topping Ben Leigh-Brown caught me and we walked the rest of the way up and ran down together. Ben had done the Lakeland 100 last year but I think he said he had pulled out so was determined to finish this one. There were a number of runners making their way down as we climbed so I knew there were a few runners ahead I hopefully could catch in the hours to come. 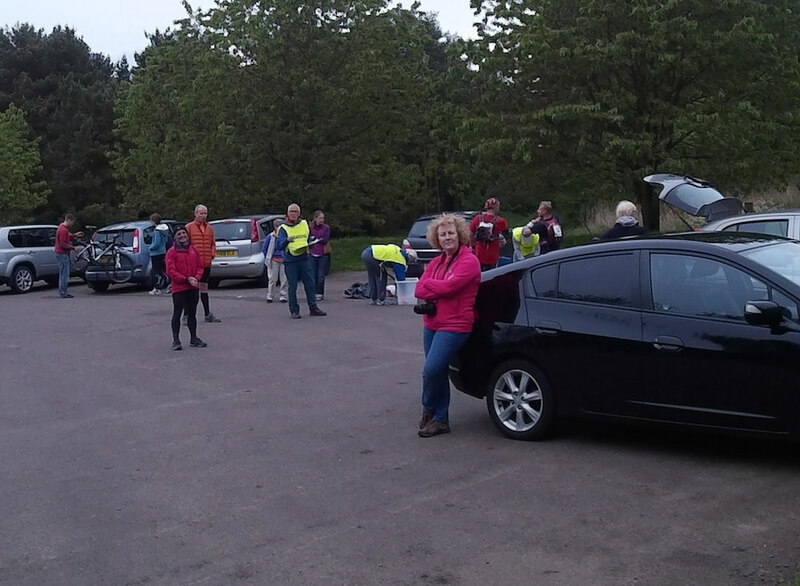 The marshals on Roseberry Topping were in great spirits and they still had several hours to go! The mist had lifted by now and the views were excellent all around. As we descended Ben asked me about times and what I was aiming for. I was still right on my sub 27hr plan. When Ben heard that he decided to ease off a bit and so I was on my own again. Once through the gate I saw Phill Turton with another runner. I gave him a wave and hoped that I wouldn’t see him again …. until the end of the race! 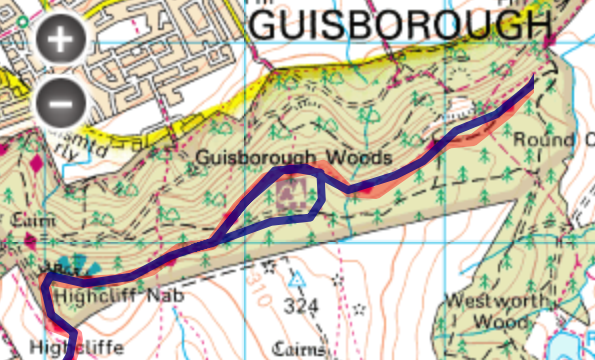 As I made my way to Guisborough Woods I rang Katrina to give her an update and said I hoped to be in Saltburn around 9pm right on plan. She told me Dave was already through going really well. So I rang Dave and we had a quick chat encouraging each other to stay focused and keep it going. I knew Dave would be able to do that and I was feeling more and more confident that my early cautious approach was really helping me to be still running as strong as I was at this point. My next mini-split was in the woods at the end of a small section where you have left the main path and then joined it again. My sub 27hr plan had 11:35 to that point and as I did a split on my watch it said 11:36. You will have to take my word for it as all that data is gone!! What happened next is not good reading ….. I made a silly mistake which cost me 14mins 35secs. I came to a path where we should have gone straight on. The acorn was on the post but a yellow arrow pointed right. I vaguely remember a conversation with Dave about we could go either way so I went right up the hill. (BTW the conversation was about another junction further on!). 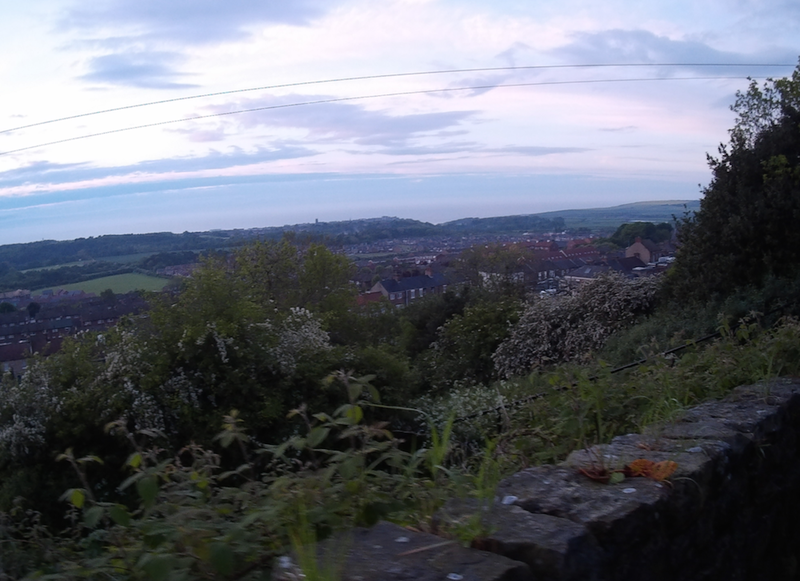 Anyway I climbed up for 5mins or so then checked my watch and I realised that I was off my gps trace. Instead of going back I convinced myself that I was on a parallel path and would rejoin the main track. After another 5mins or so my path and the gps track seemed to come together so I thought I was fine. Then a runner came towards me! I said, ‘Are you in the race?’ He said yes and explained that I was ahead of him as he saw me coming down Roseberry Topping as I was going up. I couldn’t believe what I was hearing and even tried to persuade him to go my way! He said I’m local to these woods and THIS is the WAY. As soon as I ran down the track I saw where we were. A few minutes later we were back at my mini-split. I did another split and that’s why I know I lost 14mins 35secs probably about a mile. The tracker shows my extra loop! The race had been going so well until this point but now I faced my first real set back. 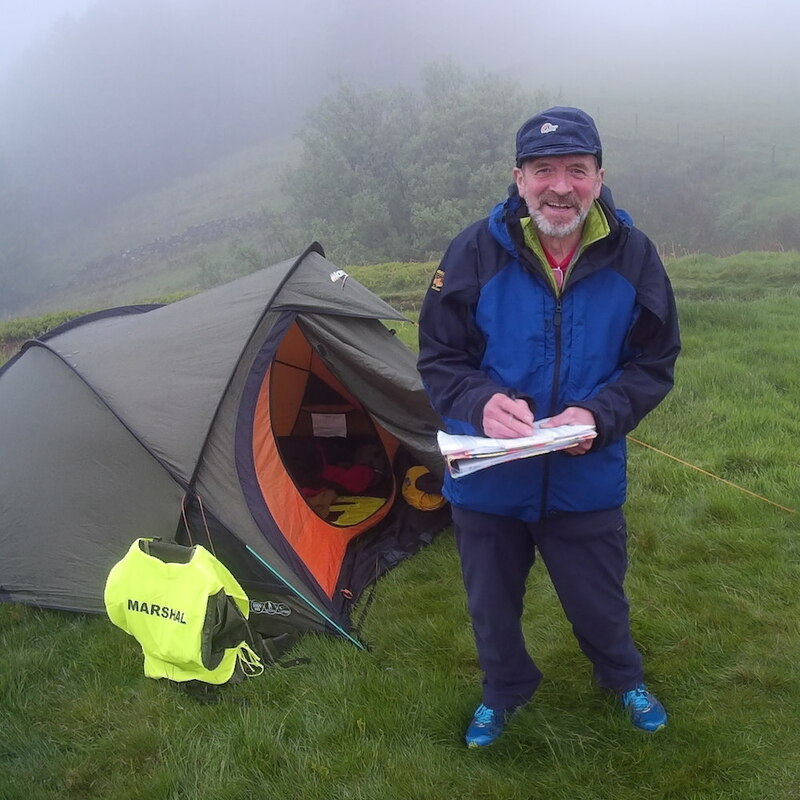 In the Lakeland 100 race in 2012 a similar thing happened at about the same stage and it really affected me mentally. I kept feeling sorry for myself that I should be further up the track and the runners I had worked hard to get past where now ahead of me again. So I was determined that this mistake would not ruin my race. I was going to have to put it behind me and not let it affect me. So I took another split and tried to put it behind me. The temptation is to try and run faster to catch up but you can never do that. I settled into a steady pace and encouraged myself that I was still running well and there would be plenty of time to make up the time I lost and still get my sub 27 time. The important thing was to concentrate on the next mini-split which was 3.26 miles away. As I descended down to Slapeworth I caught up with Mark Dalton again! I shouted it’s me again and explained my mistake. Mark was great and encouraged me to forget it and keep going as I was looking strong. Thanks Mark. I caught another runner on the hill up from the road and wondered how many more had gone past while I did my loop. I reckoned I had over 30mins on Phill so hopefully he was still behind!! Somewhere along this section I looked at my Suunto and it had ran out of battery and was blank. I hoped it would make it to Saltburn where I had the charger. Another slight set back which I had to deal with. I rang Katrina to explain that I would be nearer 9.30 than my planned 9.05pm as I run at extra mile. She said my soup was all ready for 9pm but hopefully it would stay warm in the flask until I arrived!! I really enjoyed the run into Saltburn. The path goes under a viaduct and then through trees. I reckoned I was going to arrive about 13:20 which would be exactly 15mins slower than my planned 13:05. The 15mins I lost going the extra loop! It did encourage me though that I had paced it spot on. Katrina was waiting with all my gear. I sat down and Katrina waited on me. I changed my top, had some lovely soup with a cheese pastry, a drink of hot chocolate and some flavoured water. Katrina passed on bits of news about the race and how things were going. One of the things she said was that the marshals have been telling runners to stay longer here if they think they won’t make it through Runswick Bay before high tide. I thought the high tide would be at 1.05am so I had 3hrs 30mins to get there. My plan had 3hrs so if I could keep to that I should be okay but I didn’t really know how much before high tide the beach would be closed. 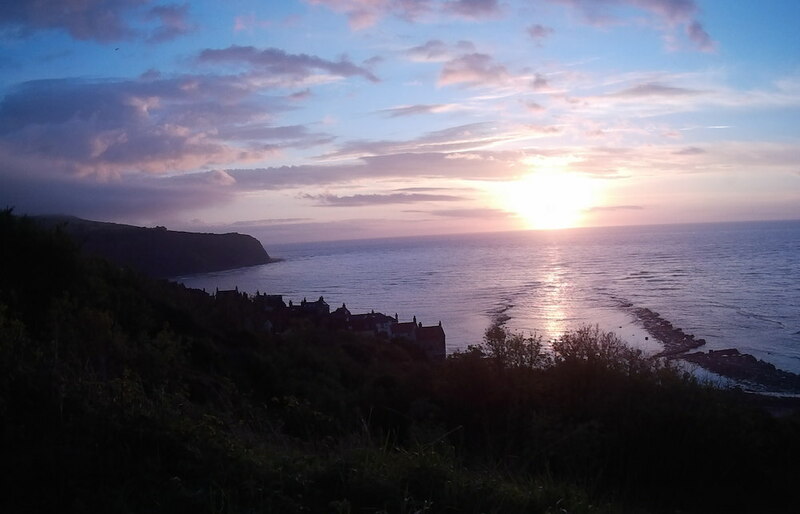 I didn’t want to hang around so decided I was going to go and try my best to get through Runswick Bay before the tide. I stopped at Saltburn for 8mins. I thanked Katrina so much for meeting me at this check point and I was off. Katrina was then driving to Scarborough where she had a b&b for the night. The plan was she would meet me there and we would run the last 10 miles to Filey together. The route now takes on a very different feel as we head all the way down the coast to Filey. I was now running with my battery pack which meant I had a wire from the watch to the pack in my pocket. It’s okay but now I realise that I lost all the data anyway it seems a bit if a waste of time. Two runners went past me as I sorted out my watch. 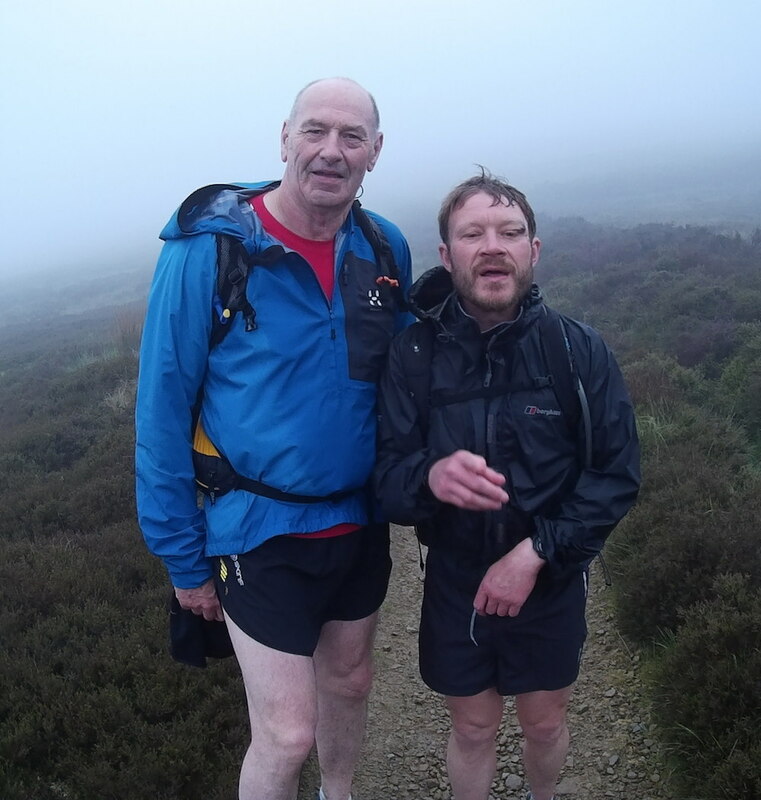 One was Ben who I had run with earlier at Roseberry Topping and Laurie Smith. It was getting dark quite quickly now and I was feeling cold as I only had my long sleeved top on. About 10pm I stopped to put on my OMM jacket, buff, gloves and head torch. I immediately felt better and realised I was feeling cold. Over the next few miles I leap frogged Ben and Laurie who seemed to be working together. When we passed each other we chatted about the tide and whether we would make it through. We all agreed it was worth pushing a bit harder to try as we didn’t fancy an unforced rest. The time waiting is taken off your overall time but I would start to seize up and find it hard to get going again. I was ahead as we approached Skinningrove. The route drops down to the beach along a sandy path. I tripped in the dark and went down. Fortunately I landed on soft ground so no damage done. I ran on and felt for my water bottle. It wasn’t there so I had to go back and find it. Ben and Laurie caught me again and we ran into Skinningrove together. This was my first mini-split for this section and I was 10mins slower than the 50mins I’d given myself. I felt I was running okay but it is harder to run at the same pace in the dark. I realised that my 3hr schedule to Runswick Bay might be ambitious in the dark so the prospect of having to wait for the tide became more of a strong possibility. I couldn’t do much about it so on the climb out of Skinningrove I decided I would try my best to make it before the tide and if I didn’t I would deal with it then. Ben and Laurie had a good mile or so and were away. I wondered whether I would see them again. I also thought how annoying it would be if they got through and I didn’t! A couple of times I saw their head torches so they weren’t completely out of sight. I concentrated on my own running and soon I was moving really well again. The path down to Staithes was easy to run on and I made the most of it. Once again I thought of those trips up and down Ben Lomond and how they had prepared my quads to be able to do this. Suddenly I saw Ben and Laurie ahead. I had caught them again plus another runner. As we crossed the bridge at Staithes we saw a female runner so the five of us ran through the village together. It was about 11.45pm and we saw a group of people were wandering down the cobble stones after a meal out. I’m not quite sure what they made of us!! I said to the group that we have about 45mins to run 3.25 miles to Runswick Bay to arrive at 12.30am which hopefully will be enough time to make it through before high tide. Ben, Laurie and I walked up the hill a fast as we could. I was feeling really good and was leading at the top. Once it leveled out I was away. I glanced back and couldn’t see the other two so decided to go for it. Maybe I would get through and they wouldn’t? I’m not sure what pace I ran as I’ve lost all the data. Did I mention that already?? But it did feel pretty fast. I did wonder whether this was the best tactic because I might pay for this later on but decided to keep going as long as I could. I must admit it was a great feeling beefing able to run this strongly after over 16hrs of running. As I entered Runswick Bay I went past another runner who was walking and it looked to be in some pain. I wished him well and ran down to the checkpoint where Steve Walker was waiting. I said to Steve, ‘Have I made it?’ He casually replied, ‘ Oh yes you have an hour or so yet! !’ All that worry and pushing the pace for nothing! He did say though that if the water looks too close then come back and wait.I took some coke and set off straight away in case he changed his mind. There was no way I was coming back up again to wait. When I got to the beach the water was lapping right up the slip way but I could see a couple of head torches on the beach so waded through the water and set off down the beach. I soon caught up the two girls. One recognised my voice and said, ‘Is that John?’ We had a quick chat then I was away. The path up the gap was covered in water so once again I waded through the water to reach the top. Once I was on the top path again I decided I needed to regroup and try and settle into a sensible pace after the rush to beat the tide. My feet had got really wet and I could feel a few hot spots. I also ate a chia bar as I hadn’t eaten much since Saltburn over 3 hours ago. I soon got going again and ran strongly down the black cinder path to the next checkpoint at the car park. I thought back to 2009. I remember Neal coming up the path to find me as I’d taken ages to arrive. It was great how much stronger I was feeling this time. I descended the steps to a ripple of applause from the marshals and supporters. I stopped for a few minutes to eat some sausage rolls and have my coke refilled. I asked whether anyone was ahead. They said Karen Nash was about 40mins ahead. That was a long way so I prepared to be on my own for the rest of the race as I didn’t think I would catch up 40mins. I hoped that no one behind would catch me. 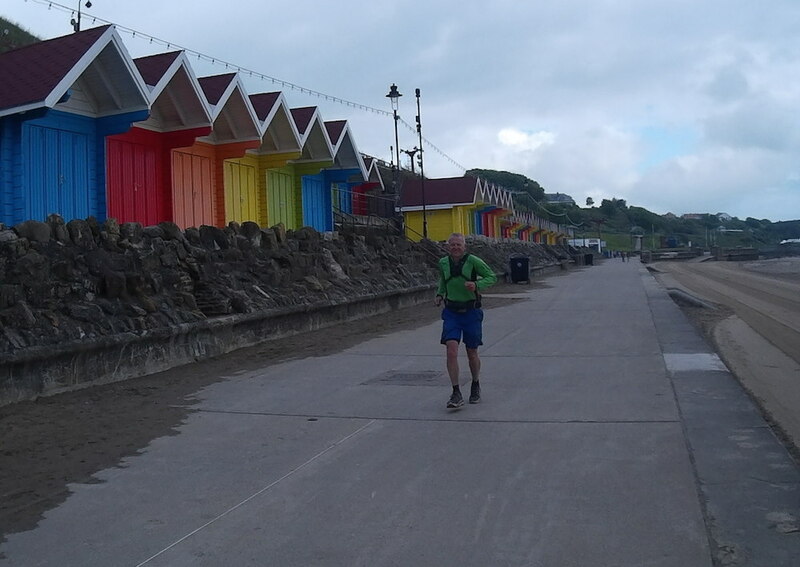 In the race in 2009 there was a checkpoint at Whitby which was a better split distance wise. I knew that this next section of 14 miles was going to be tough and go a long way towards determining how well my race would be. 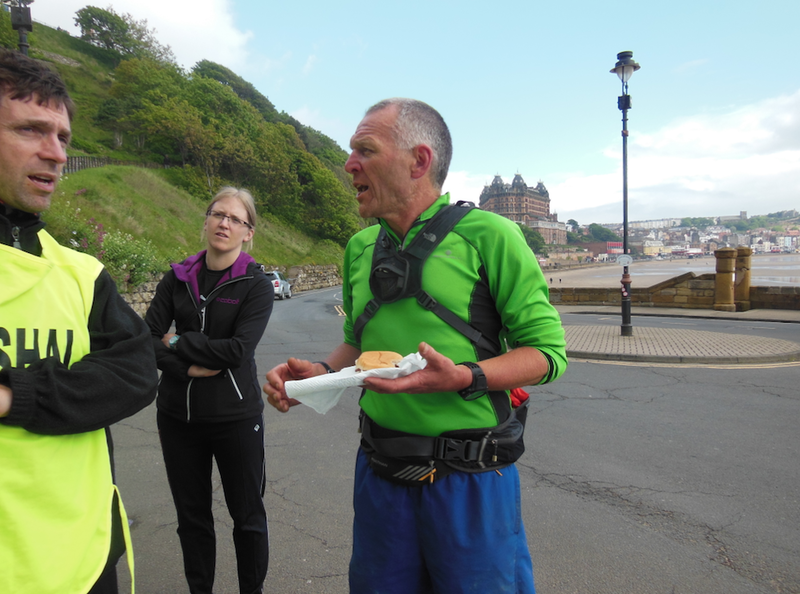 I left the checkpoint eating another sausage roll and with a banana in my hand. I got myself together mentally for the section. 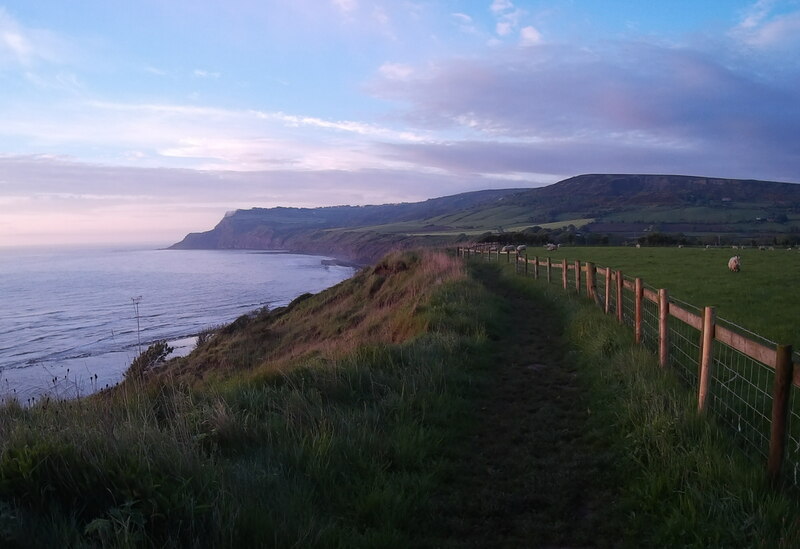 I had four mini-splits to Whitby (3.24 miles), a gate (4.18 miles), a post (3.15 miles) and then Ravenscar (3.44 miles). I would work on one mini-section at a time. The first section to Whitby was fine. I ran and walked and felt really good. The hot spots on my feet were getting a little more sore but on the smooth paths it was fine. I did start to wonder what the coastal path from Whitby was going to be like. 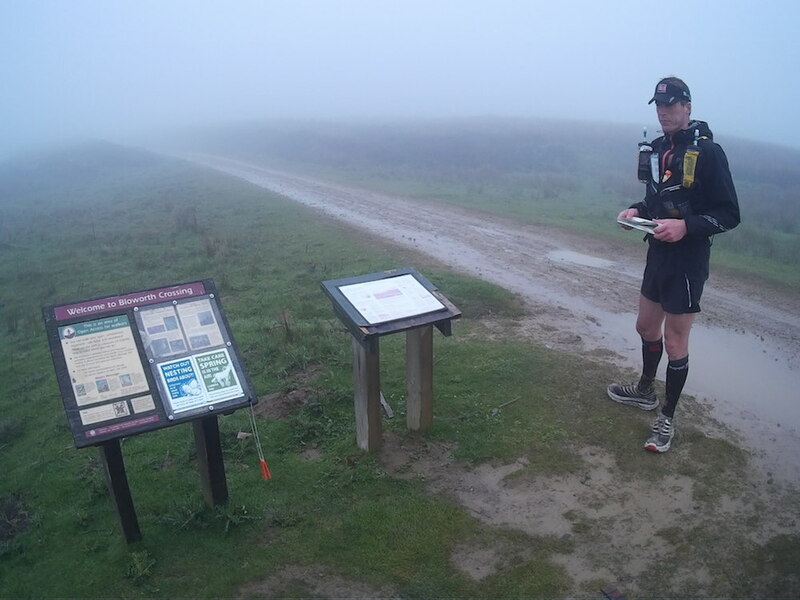 When I did the Hardmoors 30 race on New Year’s Day it was so muddy and slippy especially in my Hokas that it was really hard to get going. 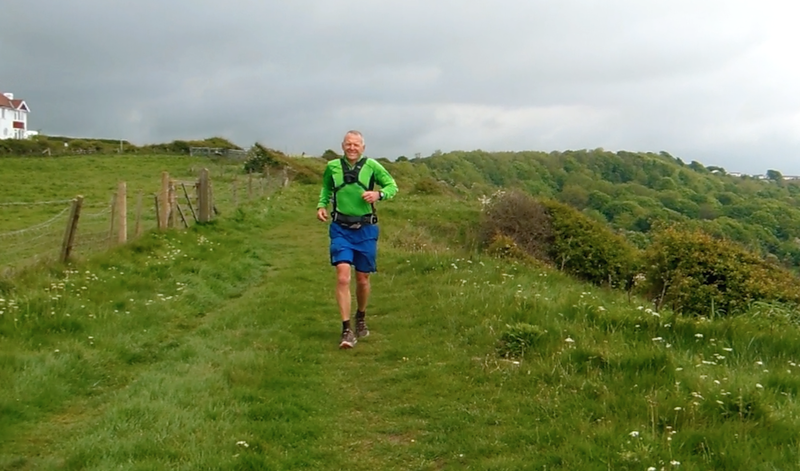 A few weeks ago on my recce run with Dave T it was dry and the path was perfect to run on. What would it be today? I would soon find out. I ran through Whitby at 1.30am in the morning and only saw one person. I had the 199 steps up to the Abbey on my own which was a novelty. Once I got onto the coastal path my fears were realised. It was muddy! Not as bad as New Year’s Day but this next 10miles to Ravenscar was going to be a challenge. Plus it was pitch dark now in the middle of the night. Plus I’d been running for almost 19 hours. Plus I was on my own. Plus my Suunto died again so I’d need to recharge and wasn’t sure of the distance to the next checkpoint and I couldn’t remember which gate was my next mini-split! You can see how my mind was working! So I zipped up the man suit and told myself this is what you signed up for. It was hard though as I could feel I was slipping behind my plan. I could run when the path was dry but on the mud, which was the majority of the time, I had to slow right down. I think I missed my gate so decided to aim for Robin Hood’s Bay. I’d seen a sign a while back which said 6 miles so I reckoned I had another 2-3miles to go. From there I knew Ravenscar was another 4.5miles. The thing that really surprised me was that no one caught me. I was expecting Ben and Laurie to catch up with me again. I wondered whether they had decided to take the break at Runswick Bay after all. Or maybe they were finding it just as hard as I was. Around 3am it started to get lighter and by 4pm I had my head torch off. The sunrise over the sea was beautiful. I paused to get a photo …. 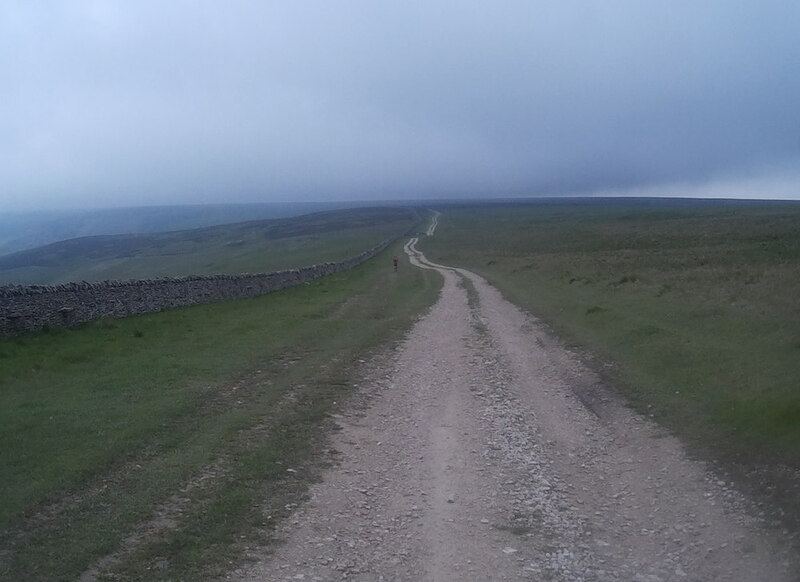 As I headed to Robin Hood’s Bay a guy on a mountain bike came towards me. He was obviously out early following the race. He told me Robin Hood’s Bay was 1.5 miles away. That really lifted my spirits and I felt I was coming out of my ‘low’ section. My feet were really sore now and the steps were the most painful as I had to drop down each time. 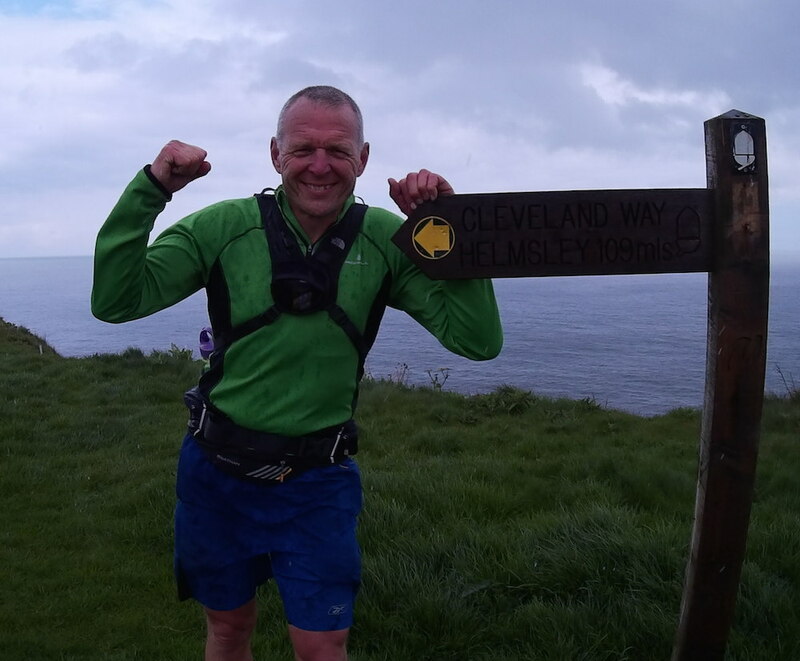 The steep road through Robin Hood’s Bay was also tough on the feet but it felt a real milestone to get through the village, climb up the other side and know that the checkpoint and some contact with people wasn’t far away. I found my next mini-split. It was the post where the HM15 rejoins the coastal path so I knew I had 3.44 miles to Ravenscar. I also knew that the last mile was a big climb up the check point. It was getting warm now so I stopped to take off my jacket. It’s amazing how getting through the night and into the next day really lifts your spirit. There was still almost 25 miles to go but the end was in sight. Soon enough I was climbing up to Ravenscar. Initially my plan had been to have 5 mins at this checkpoint but I decided I needed to look at my feet and try and deal with them otherwise I wasn’t going to be able to run as much as I wanted to. At this point I knew sub 27hrs was gone and so had sub 28hrs probably. If I couldn’t finish strongly then any time that starts with a 2 would be acceptable. But if I could sort my feet out I felt my legs were still moving well then who knows! I wasn’t sure what to do. Pop it? Ignore it? Cover it? I decided on the latter. So I asked for a plaster and stuck it over the blood blister. I had a smaller one on my left foot so I put a plaster on that as well. I was there for 13mins but it was time well spent. Steve, the marshal, told me Dave T had gone through at 2am so was over 4hrs ahead. But he also told me I was in 11th place. I was shocked as I hadn’t really thought about places. I assumed I was high 20’s at best. It really lifted my spirits and I set off with a renewed commitment to finish strongly. Just as I was about to leave two people came in. Looking at the splits I think it must have been Lorraine and a support runner. As I said good bye and thanks to the marshals at the checkpoint my feet felt just as sore but I decided to try a run and amazingly they felt better when I ran so I ran all the way down the hill to the gate, through the field and back onto the coastal path. It felt a lot colder suddenly. I’m not sure whether it was because I’d been inside for a few minutes but I wondered whether I would need to put my jacket back on. I decided I’d keep running and that would warm me up. When we did the recce I remember saying to Dave that if I’m still running at this stage it’s going to be a good race. I was running and all my positive thoughts came flooding back. My plan for these last two sections were 3:05 to Scarborough and 3:00 to Filey. I left Ravenscar just after 22hrs so 6:05 would give me just over 28hrs hours. I decided I would aim for 28:30 and anything faster than that would be a bonus. The miles ticked my quite quickly. At 7am I rang Katrina and told her I was hoping to be at Scarborough checkpoint for 9.30am so she had time to get some breakfast at the b&b. She said she would run along the prom to meet me which was a great idea. 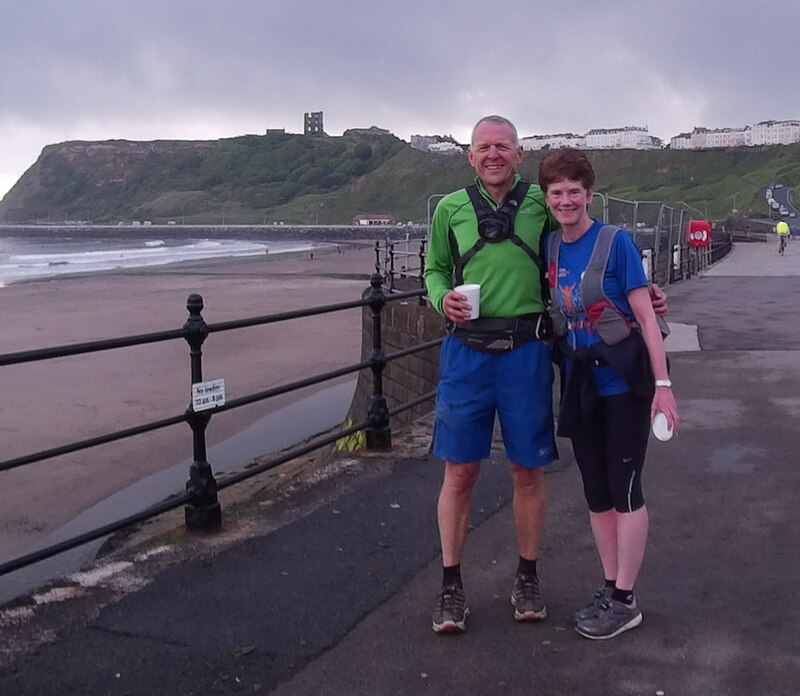 In my planning I was really looking forward to having Katrina with me to run the final 10 miles to Filey. It had kept me going through the low points in the night and I was so glad that I was still running so she could enjoy it as well. Scarborough Castle came into view, disappeared again as I went inland around the path and then appeared again a lot closer. The steps down to the prom were hard on my feet and legs but I took it easy and got there. A number of folk out for a morning walk with their dogs greeted me. I wondered what they would think it they knew I’d been running for over 25hrs! I was met on the prom by Gary Brown on his bike. We have met a couple of times. He was taking some photos of me so I asked him to take my camera and get some on mine! He cycled ahead and waited for me to come. I wanted to run as much of the prom as I could so settled into a pattern of running for 100 breathes, walking for 50 then repeating. If I was still feeling okay at 100 I would do another 50. There were a number of runners out coming towards me. Most had head phones on and lost in their own world. It did feel strange having run through the night on my own to be part of a different world. About half was along Katrina came towards me with a cup of tea. It tasted great. Gary took a photo of us then said goodbye wishing us all the best for the last leg. Katrina and I then ran the rest of the prom to the checkpoint. Katrina chatted away giving me all her news. It was mainly a one way conversation as I was concentrating hard on keeping running! Katrina read out a number of texts that were on my iPhone that she had. It was really encouraging to hear of friends wishing me well. I also found out that Dave had finished 2nd in under 23:30! A superb time and a superb run. I kept giving myself a target to run to. A bin or bench. Then a short walk to drink some coke and off again. Once we got round the Castle the path was busier and again it seems so strange to be running past and through people who are out for a Sunday morning stroll when you have run non-stop since yesterday morning. The Spa Hotel was now in view where the checkpoint was waiting for us. Once we arrived I was offered a bacon roll. I asked how long it would take to make as I didn’t really want to stop. It’s ready now they said so I took one! It was delicious. Thank you. Katrina needed the toilet so I headed off after explaining the way. This is where I went wrong in 2009 so it was soooo good to go the right way and not waste an hour wandering around! Katrina soon caught me up and we walked up the hill. It was hard work up the hill but I knew there were lots of very runnable sections to Filey and I was so pleased I was strong enough to run. If I could run the 10miles to Filey in 3hrs I would be under 28:30. That was a good goal and kept me going. Katrina kept saying how strongly I was running and I was pleased that my early easy pace was paying off big time now. A couple of times Katrina stopped to take a photo and had to work hard to catch me up. We arrived at my first mini-split 15mins faster than my plan so my 28:30 goal became 28:15. At this stage a few minutes either way wasn’t going to make much difference. I was just pleased with the fact that I was loving running so strongly this late in the race. The next mini-split was Filey Brigg which was just over 4 miles away. Then it was only 2 miles from there to the end. A 10k was all I had left! We chatted as we ran together and the miles passed fairly quickly. The only hard bit was when the path was really overgrown and very muddy. Katrina pulled ahead then as I was struggling with my sore feet as I slipped. Thankfully it didn’t last too long and the path opened up with Filey in view to our right. Half a mile or so we caught up with a runner who was walking slowly with his support team. I encouraged him to finish it off. Katrina had a bit more of a chat and told me he was finishing the 160. Very impressive. We paused at Filey Brigg to get a photo next to the sign which says Hemlsley 109 miles. I have just run from Helmsley! How great is that?? I looked at my watch and I realised I had 34 mins to run the final 2.47 miles. I knew in my the back of my mind that I should be able to do that but I don’t think I wanted to acknowledge it as it would meant I’d have to push and I wanted to enjoy the final run in! I think Katrina had other ideas so we pushed on. The tide was out so we were able to run along the beach. Katrina took a great video of me running which I was able to get this photo …. I couldn’t remember whether the final checkpoint was at the start of the prom or the far end. It wasn’t at the beginning so assumed it must be at the end. Thankfully Filey prom is not as long as Scarborough and after a few minutes of running we were greeted by John Vernon. He offered all sorts of things but I took a jaffa cake and set off for the final push to the finish at the High School. I had 16mins to get under 28hrs. I was still not really bothered either way. Just over 28hrs was fine with me. We walked up the hill and to the golf course then ran along the Centenary Way. Katrina was 50 yards ahead but I didn’t want to push too early. Once we got past the campsite and I could see the main road and the hill just before the school I realised I had 9mins to run just under a mile. I could do this! I owe to myself to run as hard as I can for the final mile. If I get under 28hrs and my silver goal then great. If I miss it that’s fine as long as I gave it a go. 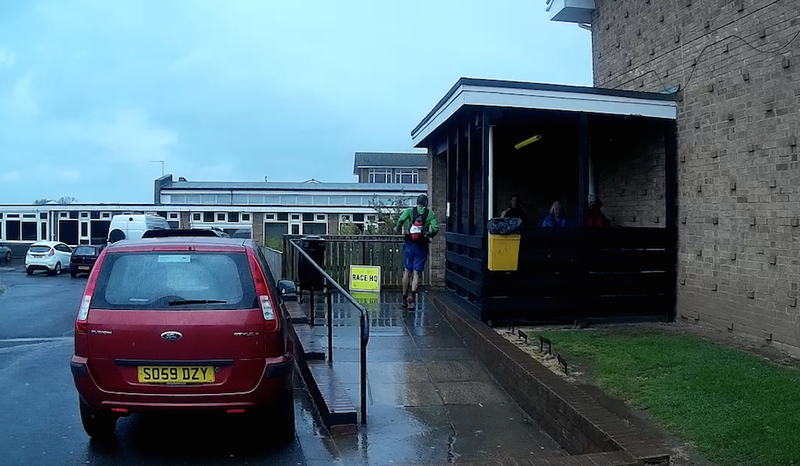 We had arranged for Katrina to run ahead so she could video me coming in but she couldn’t get away and was only 20 yards or so ahead as we entered the school round to the left and into the gym where Jon & Shirley were waiting for us. I had finished 11th in 27hrs 58mins 10secs. I was 2nd M50 just 8mins behind 1st place but I never saw him all day. At one point he was over an hour ahead so I was closing! I was absolutely chuffed. That was a 3hr 10mins pb from 2009! But more importantly to me I ran it the way I planned. A sensible run to Saltburn with enough in the tank and legs to enjoy the second half. No doubt I will post some lessons learnt another day but first of all thanks to Katrina for all your support over the weekend. I know you didn’t enjoy the drive to Saltburn and Scarborough but I so appreciated having your support at both places and your company for the final section. Thanks to Jon and Shirley for organising such a superb race. 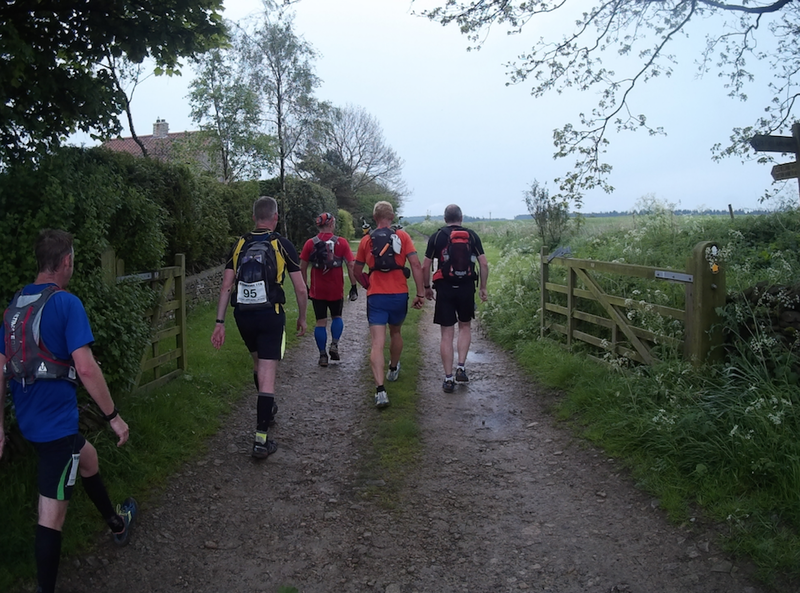 In 2009 there was just the 110 now they have loads of races from 10k to 160 miles all off road in the North York Moors. 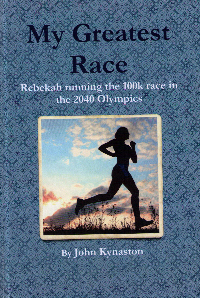 They have maintained a lovely family feel and they are very much runners races. Finally thanks to all the volunteers who gave up their weekend to make it possible for us to run. It is so appreciated and each and every one of you are stars!! 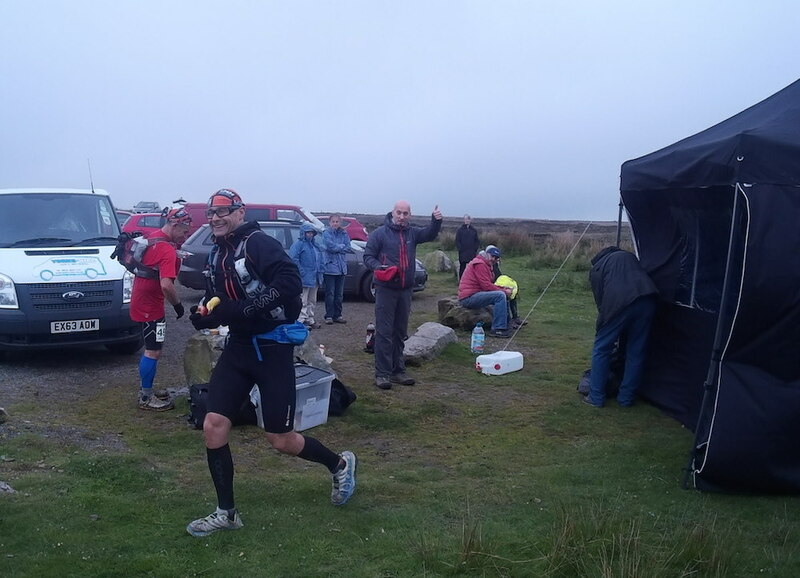 This entry was posted in Hardmoors 110 Race Report. Bookmark the permalink. Great run John and as usual an insightful write up. I also subscribe to Robert Osfield’s HR methods and feel it has helped me enormously this year. Well done for showing the discipline that I slightly lacked 2 weeks ago! Epic report and race John, inspiring reading. I followed your progress via the live tracking and it was an exciting finish to see whether you’d make it under 28 hours, which you did which was great to know about even as rather remote spectator. Roll ones eyes about the technology failure… it’s a shame loosing the data, but didn’t seem to affect your racing which is important thing. Do you have any idea what your HR was in the second half? Well done to yourself and the rest of the competitors. Thanks Robert. I did look now and then at my heart rate in the second half and it seemed to be around 110-115 but I didn’t look at it when I was running. It would have been really interesting to see what it was!! Great write-up, John. Thanks for your company into Kildale; it was good to meet you. 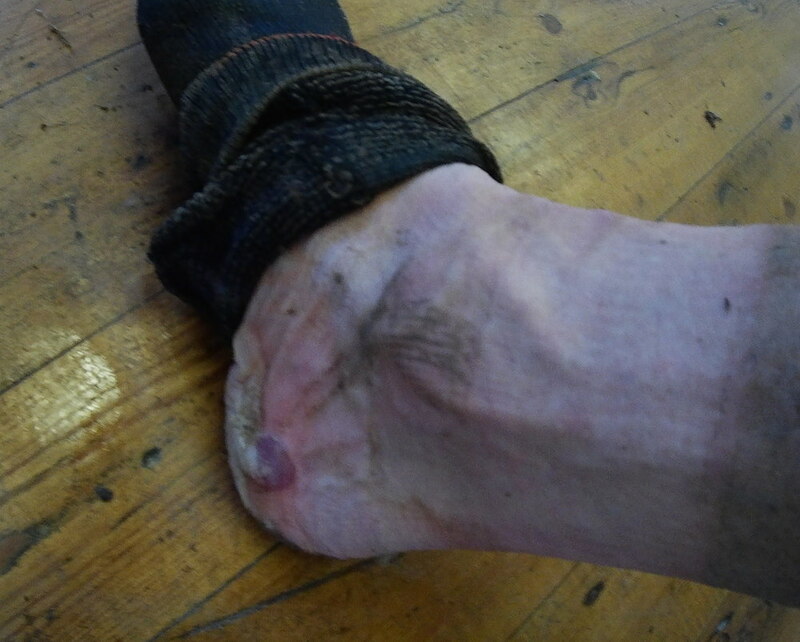 I really suffered foot-wise along the coast but managed to hobble in just under my 30hr target; I’ll post a report, and matching blister photo, soon. What a fantastic event: I hope all your Hardmoors commitments, running and otherwise, go well! 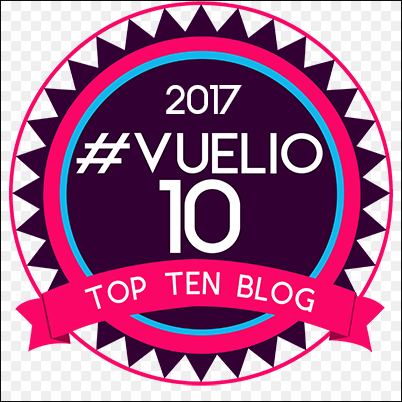 Well done John, always good to read your blogs. Epic report John, that must have taken about as long as the race itself! Brilliant result, quite some improvement to last time. Don’t worry about the lost data – you’ve got the memories, which are much more important. You’re a lucky guy to be able to run the last 10 miles with our wife. I presume you know and appreciate that. 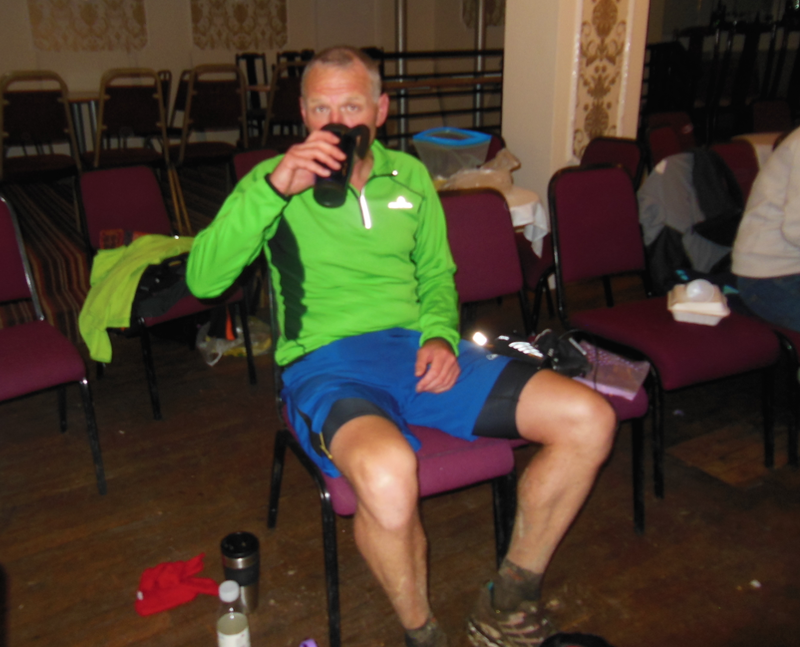 Well done John – fantastic effort!